Fitting a mortice lock involves removing wood and this leaves a very weakened area around the frame. 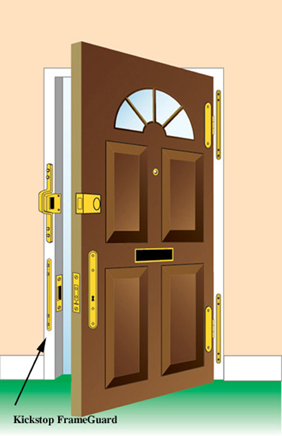 The Frame Reinforcer plates are bolted together through the door frame - to resist a 'kick-in' attack and forced entry and so help avoid a burglary. The FrameGuard is available in six sizes, five polyester powder coated architectural finishes and two polished and plated finishes. FrameGuards can also be fitted to strengthen the frame around the hinges. NB: Fitting a FrameGuard around the hinge is relatively difficult to do without removing the door. A very much easier to fit option would be HingeGuard Plates or a Birmingham Bar. All supplied with security bolts and fitting instructions.